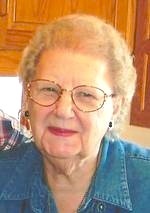 Lois E. Tripkos, 94, of Independence, MO, formerly of De Soto, KS, passed away Sun., Nov. 15, 2015, at Rosewood Health and Rehab Center in Independence, MO. Visitation 10:00 am with Funeral Service at 11:00 am Fri., Nov. 20, 2015 at De Soto United Methodist Church, 8760 Kill Creek Rd., De Soto, KS. Burial follows at De Soto Cemetery. In lieu of flowers the family suggests memorial contributions to De Soto United Methodist Church. Arrangements: Bruce Funeral Home, Gardner, KS (913) 856-7111. Lois was born Feb. 27, 1921 in rural Eudora, KS to Earl Hadley and Lenna (French) White. She grew up in Prairie Center and was a life-long Johnson County resident. Lois graduated from De Soto High School and attended Kansas City Business College. She married Raymond William Tripkos, her high school sweetheart, on May 24, 1942 in Prairie Center, KS. Lois was a homemaker while her daughters were in school and later worked as a secretary and bookkeeper for the De Soto School District #232 for 20 years; retiring in 1985. She was a member of the De Soto United Methodist Church. Lois was an avid seamstress and loved to fish and travel with her husband. She enjoyed writing stories of her childhood in Prairie Center, KS. Lois was a hard worker and an optimistic, positive person who was grateful for everything she had. She was preceded in death by her parents; Raymond, her husband of 71 years and her three siblings. Lois is survived by two daughters, Carol, wife of Charles Ramirez of Independence, MO and Barbara Boroughf, PhD, wife of Bill of Cape Coral, FL; four grandchildren, Tony Ramirez, Lupe Ramirez, Dr. William Boroughf and Benjamin Boroughf, Esquire; five great-grandsons, Malin Ramirez, Mesan Bailey, Bodhi, Xander and Archer Boroughf; and one great-granddaughter, Lucy Boroughf.